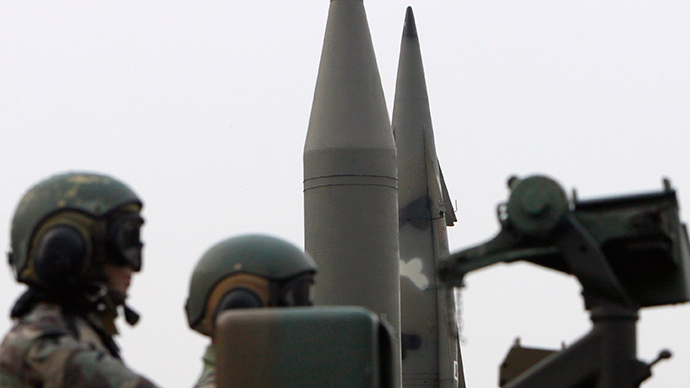 South Korea reiterated it hasn’t consulted with the US over plans to build a missile defense system. China voiced its displeasure at such a possibility, but Seoul says they are looking to build their own system, independent of Washington. The US had indicated their interest in installing a THAAD (Terminal High-Altitude Area Defense) system in South Korea. America, which has about 29,000 troops stationed in the South says the system is non-threatening and is designed to eliminate short, medium and intermediate ballistic missiles from higher altitudes. "Our stance is that the US has not made a decision and has not made any official request for the THAAD deployment on the Korean Peninsula," foreign ministry spokesman Noh Kwang-il told reporters, according to Yonhap news agency. "No consultation (between Seoul and Washington) has been made, either." This stance was echoed by the US Ambassador to South Korea, Mark Lippert: "We are not in any formal negotiations with the government here ... It's not an imminent issue we are in discussion," he said on January 27. Noh says South Korea intends to go it alone and build its own missile defense system. "To respond to North Korea's missiles threats, we will build our own Korea Air and Missile Defense suitable for the strategic circumstances of the Korean Peninsula,” he said, adding that China had been kept updated with all the developments that had taken place. The South Korean response to deny plans of hosting a US missile defense system was followed by a warning from the Chinese Foreign Ministry. Spokesman Hong Lei said that any moves by Seoul to house an American missile defense system on its soil could led to an escalation in regional tensions. "We hope that the relevant country will properly deal with this issue in the overall interest of peace and stability of the whole region as well as the overall interest of bilateral relations," Hong said on Thursday, as cited by Yonhap. "We believe that countries should bear in mind the security interest of other countries as well as regional peace and stability in the pursuit of its own security." Hong’s comments came a day after China’s Defense Minister Chang Wanquan held talks with his South Korean counterpart Han Min-Koo. China has already been critical of US President Barack Obama’s bid to try to counter China’s rising influence in the Asia Pacific region. Speaking at last year’s APEC summit in Australia, Obama said Asia security must not be based on "coercion or intimidation ... where big nations bully the small, but on alliances for mutual security,” in what was perceived as a veiled threat towards Beijing. China has already been incensed by the US’s decision to position an X-band missile defense radar in Kyoto, Japan. Chinese Foreign Ministry spokeswoman Hua Chunying said "relevant countries” should not use their own security interests as an excuse to damage the security of others, China’s Xinhua daily reports. "Some countries have pushed forward anti-missile system deployment in the Asia-Pacific region to seek unilateral security, which runs against regional stability and mutual trust as well as peace and stability in Northeast Asia," Hua told reporters in October. In July, Russia also hit out at the possible THAAD missile site in South Korea, citing security concerns. “We expect the leadership of the Republic of Korea to thoroughly weigh possible consequences of such a move, including for the security of their own country,” the Russian Foreign Ministry warned in a statement on July 24, 2014. “In fact there is a prospect of expansion of America’s global anti-missile defense system into South Korean soil. Such a development will inevitably impact the strategic situation in the region and may trigger an arms race in North Eastern Asia,” the ministry added.